Encompass bed and bath products assist in creating a room environment appropriate for rest and respite. Patients should feel positively about their room so that they can concentrate on their medical circumstances. Bedding and bath products used to care for patients should be selected for their quality and the comfort they impart to the patient experience. A patient’s sense of well-being comes in part from their perception of care and attention to detail. 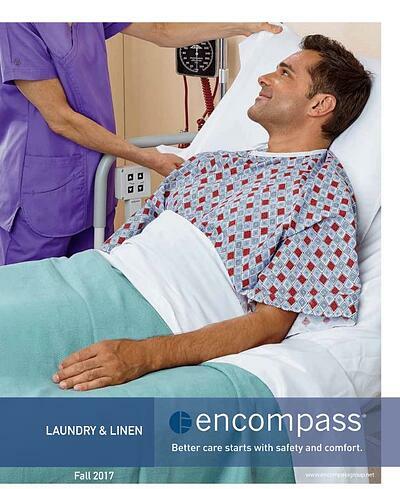 Encompass offers high quality patient focused products that meet this need. 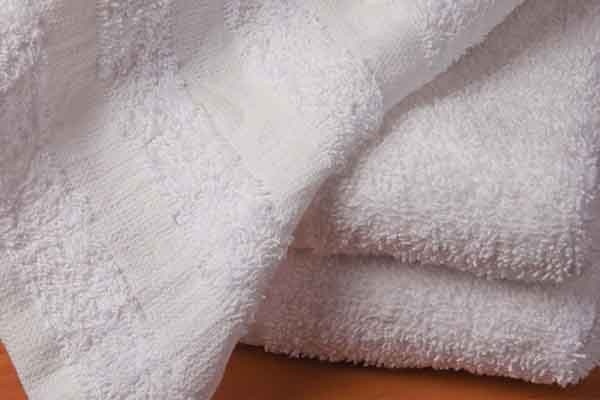 A broad array of choices are available in blended and knit sheeting, bedspreads, spread blankets, thermal blankets, bath blankets, disposable and reusable pillows, and terry towels and washcloths. Whether you require the high aesthetic appeal of our Impressions line, the durability and longevity provided by our Synergy line, or the economical focus of our Essentials and Merit lines, we have a product to help create a pleasant patient experience. 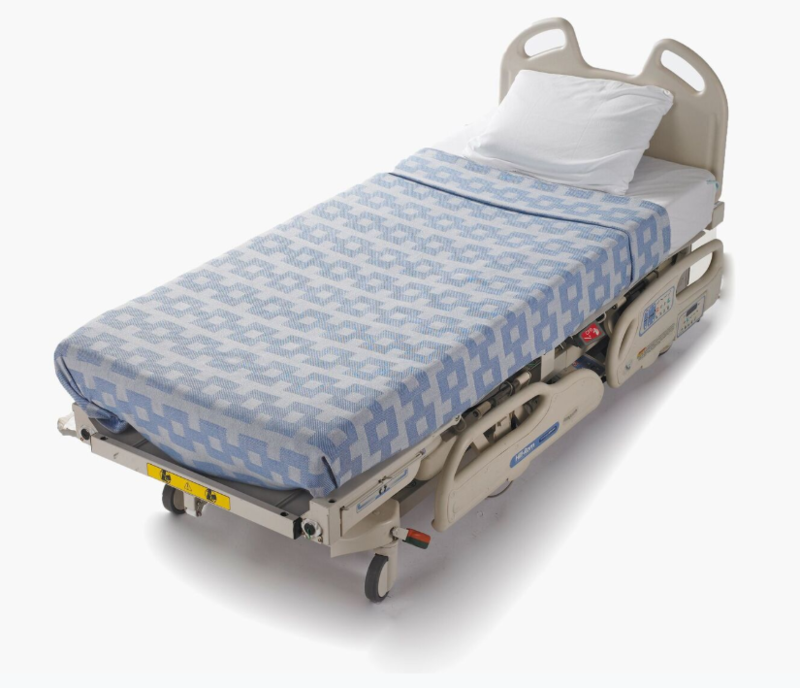 Creating the perfect comfort bed for your patients’ comfort and care. Each individual item in the perfect comfort bed concept was designed to improve patient care. 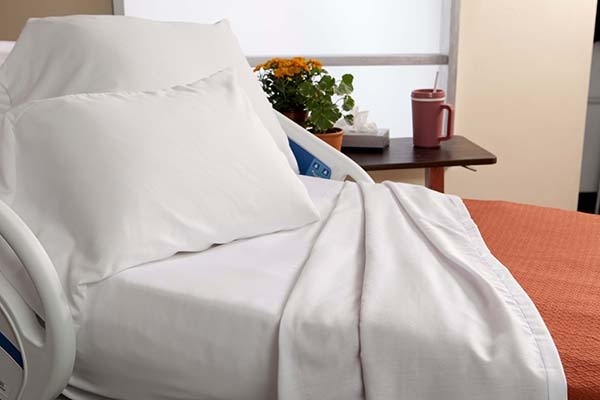 Smoother linens mean less wrinkles and bunching to reduce the risk of pressure points. Toe-tented top sheet reduces pressure on toes and heels. Minimal layers under the patient allow the pressure redistribution mattress you use to do its job. Low-friction patient positioner reduces skin damage from shear and friction, as well as helping to reduce staff injuries. 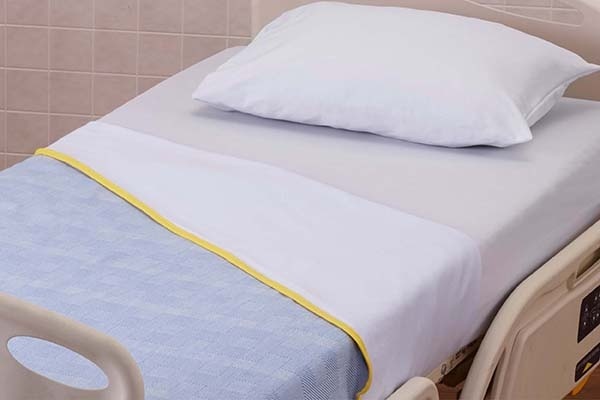 Learn how selecting the proper bed linens and incorporating a no-fold system can enhance your patient satisfaction scores. Contact us for more details. Moisture management is important to successful skin integrity in the acute care setting. Quality linens also have a factor in reducing the amount of bunching, pressure, shearing and friction to which patients are exposed. Not all incontinent pads, whether reusable or disposable, perform the same. Incontinent pads were originally designed to protect the sheets and mattress rather than the patient. Many pads in use today still adhere to this historical design. We are now more aware of the extent that excess moisture, bunching, pressure, shearing and friction from bed linens and related incontinent products can contribute to skin breakdown and discomfort. A well-designed incontinent pad, along with good nursing care, can help to mitigate all those negative influences. FACING — get moisture away from skin; provide soft, comfortable surface. Modern, all-polyester fabrics provide the softness that cotton does, but are designed to wick moisture from the top facing into the soaker level. For best patient care, we recommend a high-performing all-polyester facing, instead of one made from cotton fabric. SOAKER — attract, hold and disperse moisture over multiple voids. 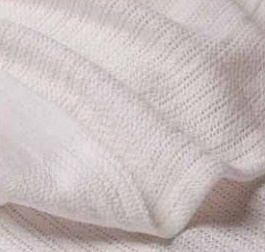 A good patient care pad will have a minimum of 35% rayon, which is more effective at drawing the moisture into the soaker and quickly spreading it horizontally. Disposable incontinent pads generally use polymer gels to capture liquids. However, once activated, the gel usually cannot absorb or disperse more liquids on multiple voids like a reusable pad can. BARRIER — keep moisture inside pad; keep pad from slipping down the bed. 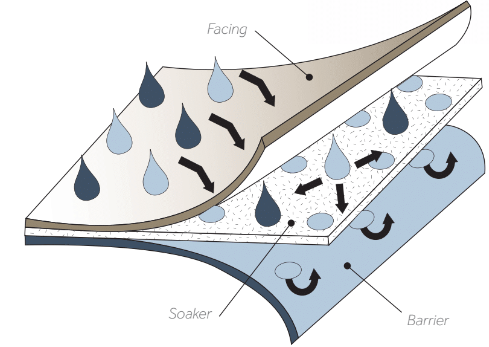 The best patient care pads “bond” their barrier layer to the quilted facing and soaker levels. Bonding ensures that the pad will not bunch on itself, and also makes it more durable and wrinkle-free during the laundering process. 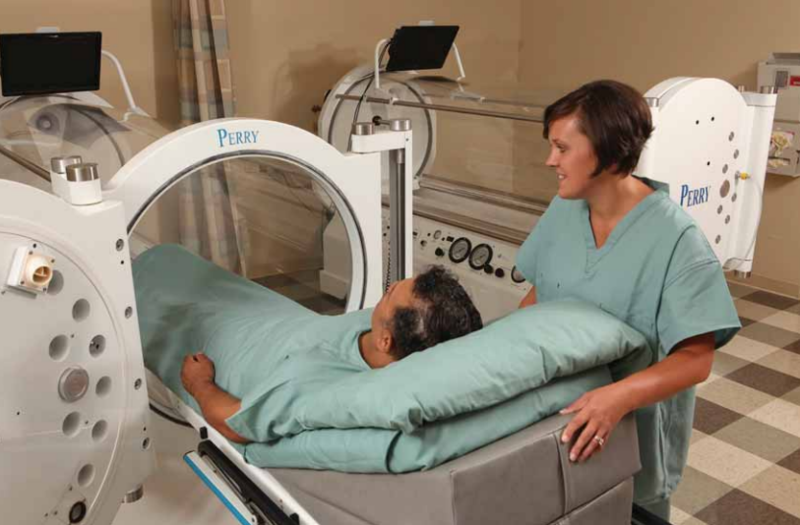 From pillows and bedding to patient apparel, Encompass’ line of hyperbaric products and apparel are designed to meet the unique challenges of a hyperbaric environment. These products are made of 100% cotton for comfort and breathability and meet or exceed National Fire Protection Association guidelines for use in hyperbaric oxygen treatment units. Contact us to learn how or call us at 1-800-284-4540.